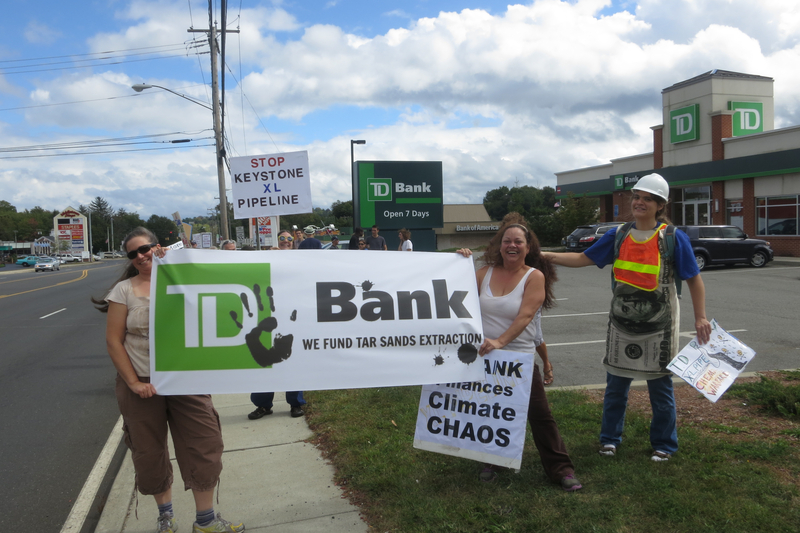 Picket TD Bank, Tar Sands Financier! 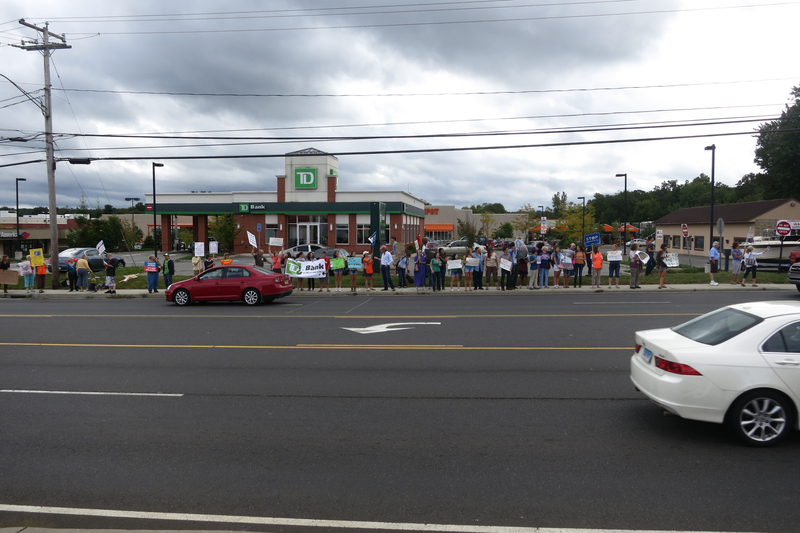 Check out these photos from our Middletown demo on Sept 21. 65 people turned out! 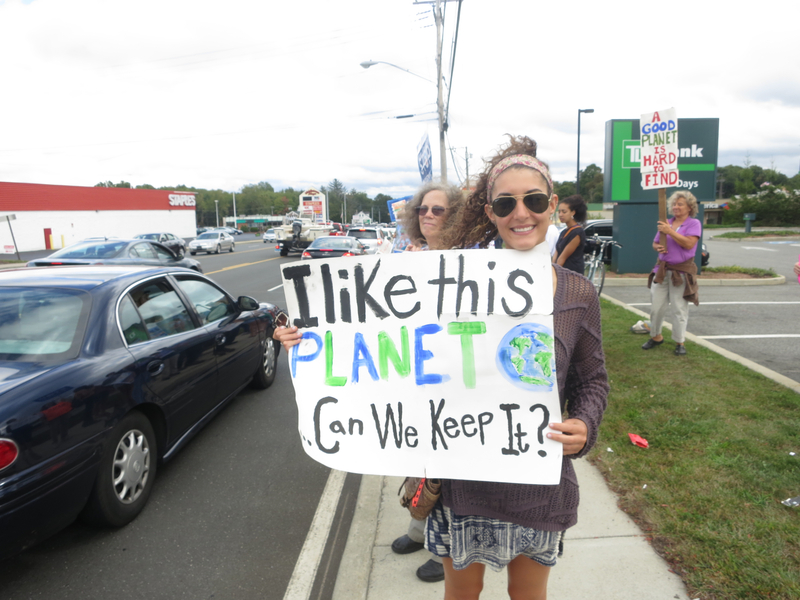 On Saturdays, we will be picketing TD Bank locations around CT in protest of their investments in the Keystone XL pipeline. Saturday August 31 at 11 am: 2035 Broad St, Hartford, CT.
Saturday, September 14 at 11 am: 994 Chapel St, New Haven, CT.
Saturday, Sept 21 at 11 am: 911 Washington St, Middletown, CT.
Saturday, November 9 at 11 am: 994 Chapel St, New Haven, CT.
Want to organize a protest at a TD Bank near you? Contact us at capitalismvsclimate@lists.riseup.net! TD Bank is one of the largest financial backers of the proposed Keystone XL pipeline, which would transport the carbon-rich and leak-prone tar sands from Alberta. Tar sands spell “game over for the climate” and add 120 ppm CO2 to the atmosphere, according to NASA’s leading scientist James Hansen. Downstream from the extraction in Alberta, indigenous Fort Chipewyan communities experience water contamination, increases in rare cancers and other impacts which Mike Mecredi describes as “slow industrial genocide.” The pipeline threatens homes and ecosystems from Montana to Texas. People like the 78 year old Texan grandmother Eleanor Fairchild have been arrested for “trespassing” on their own land, trying to protect their homes from being destroyed. TD holds 24,391,713 shares in TransCanada, the company behind the pipeline. TD loaned $993 million to the pipeline project between 2007 and 2010. Move your money and accounts to a local credit union. There are many credit union options in CT, which give back more to our local economy and are democratically controlled by their members. Enter your zip code at asmarterchoice.org to find a credit union close to you.